When Jesus was a boy he lived in a town called Nazareth. 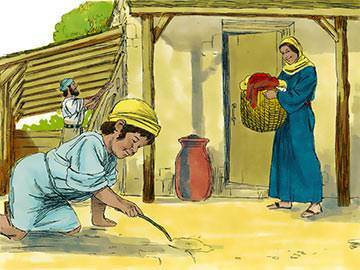 The kind of home that Jesus lived in was different than our houses. 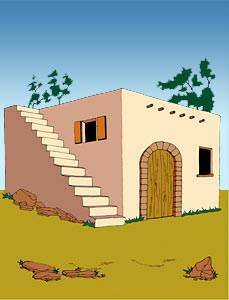 Most of the houses in Nazareth were small, square houses with flat roofs. Some had two rooms but many had only one room. Some had one or two windows, and others had only the door for an opening. There was not much furniture in these homes. Perhaps there was a low table and some benches or chairs. There were some chests pushed back against the wall. In these chests the family kept their clothes, and—you will be surprised to hear—their beds! 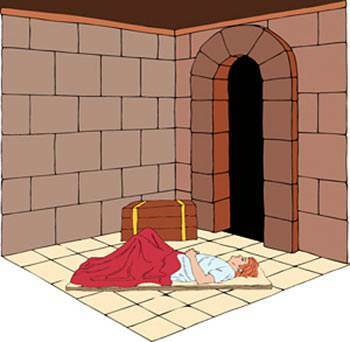 For when Jesus was a boy, people slept on soft, thick rugs or mats spread on the floor. In the daytime each mat was rolled up into a bundle and put into the chest out of the way. On the outside of the house there was a stairway leading up to the flat roof. There was a railing around the edge of the roof. Often the children played upon the roof of their home, and often on hot nights the family took their mats and went up there to sleep. Perhaps Jesus often slept this way. 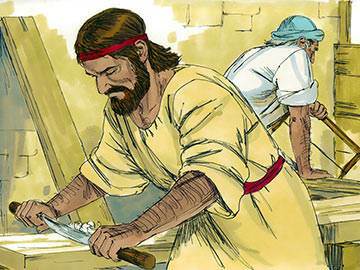 Part of Jesus’ home was a carpenter shop, for Joseph, the father of the family, was a carpenter. Jesus was the oldest boy in the family, but he had four brothers and at least two sisters. What happy times they must have had together in their little home. We are very sure Jesus was always ready to help the younger children and to take care of them. 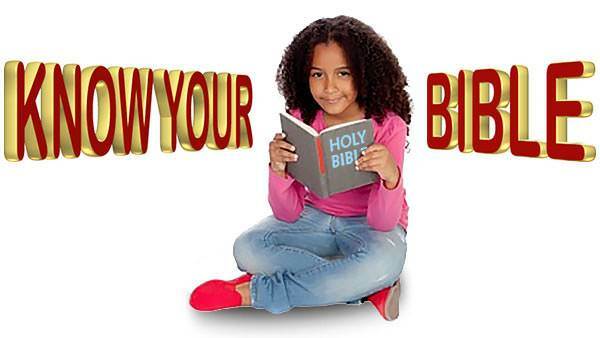 Perhaps he told them stories from the Bible, for Jesus knew many of the same stories that you know. 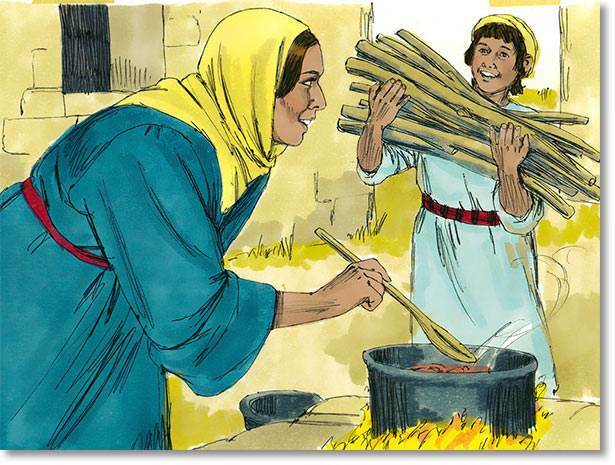 There were many things that Jesus could do to help in the home. Do you suppose that Jesus ever pouted and complained when Mary or Joseph asked him to do an errand? Do you believe Jesus always waited to be asked when there was some work to be done? We are very sure that Jesus did his part gladly and cheerfully. The Bible tells us that Jesus lived in Nazareth with Joseph and Mary and that he was “subject unto them.” By that it means that he obeyed them. Jesus knew the verse, “Honor your father and your mother.” He honored them by obeying and helping. 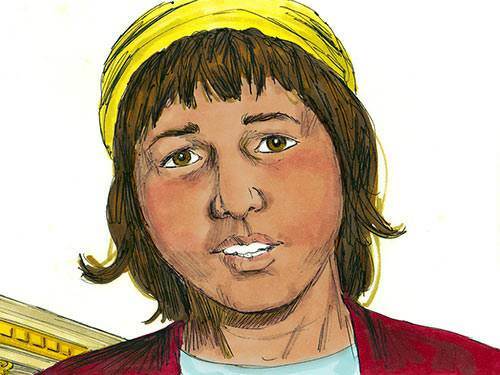 Even when he was little he could run errands for Joseph and Mary. He could help with the younger children. He could help Mary about the house. He could go to market for his mother. As he grew older he could go to the well with Mary to carry the heavy water-jars. 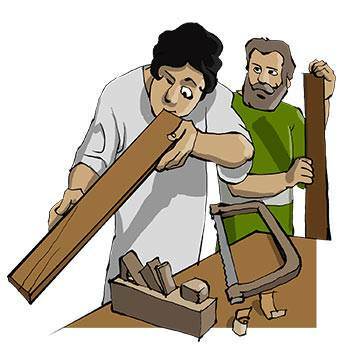 And then as he grew bigger still he could help Joseph in the carpenter shop. He learned to use the hammer, drill and plane. Perhaps he helped to make chairs and tables and chests. Perhaps when he was not busy he made little wooden toys for the younger children. So the boy Jesus grew bigger and stronger day by day. And he lived in the little home at Nazareth, helping to make that home a happy place. The Bible tells us that “Jesus advanced in wisdom and stature,” which means that he kept learning new things as he grew taller. And that is the way you grow too. It also tells us that Jesus grew “in favor with God and man.” That means that Jesus lived so that the heavenly Father and all those who knew him were pleased with him and loved him. Will you try to grow in that way too? Then you will be helping to make your home a happy place.